The National Zoo provided the first updates on its growing panda cub Thursday morning, hours after the government shutdown -- and its ensuing media blackout -- ended. The cub, now eight weeks old, weighs more than five pounds, and her eyes have partially opened. Keepers noticed her right eye began to open Oct. 4, and a week later, both eyes had partially opened, they said. Her ears are open and she is reacting to the noises she hears in the panda house. While the still-unnamed cub won't be walking until she's about four months old, she is strong enough to push herself up on her front two legs, and to turn herself over when lying on her back. The Panda Cam is back online, although it wasn't loading for everyone due to volume, as users around the region rushed to get their first glimpse of the cub in more than three weeks. Keepers also shared a video of the cub receiving an exam. They've previously said she's very active and wiggly, skills demonstrated in this latest video. The National Zoo will reopen to visitors Friday morning, although the cub will not be on view until she is older. 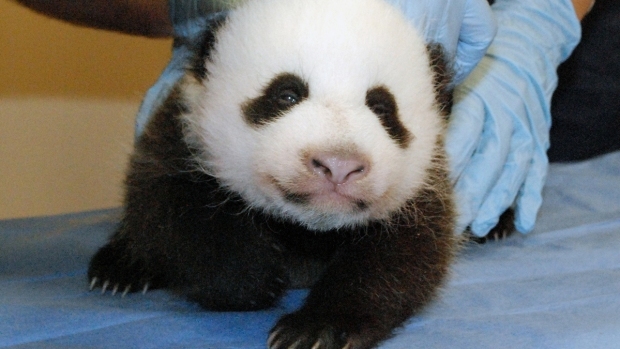 National Zoo's Panda Cub Is a Girl!